Tags: Buttock pain, Hip pain, Piriformis, Piriformis syndrome, and Sciatica. Piriformis syndrome is a condition whereby the sufferer feels pain in the buttock but can also feel sciatic type pain in the leg. The Piriformis is a muscle that is found deep in the buttock under the larger Gluteal muscles. It is attached to the bottom of the spine at one end and to the bony point on the outside of the hip at the other. When the muscle is overused or put under undue stress it can develop a painful knot within it and put pressure on the sciatic nerve that passes very close the Piriformis muscle on its path to the leg. This pressure on the sciatic nerve can send pain, pins and needles, tingling, numbness and even cause weakness in the affected leg and foot. It may be worsened by sitting on hard chairs or bike saddles, prolonged walking or any movement that requires the buttock muscles to work. The Piriformis is often seen as the bad guy of the buttock muscles due to the pain it can cause, however, when it becomes tight it is simply trying to protect the area when other muscles in the buttock or core are failing to provide the strength and control required. It is up to your physiotherapist to determine why this might be. Some of the reasons that the muscle may become tight and knotted are; Pain in the low back or hip, poor core or Gluteal muscle strength, or, trauma, such as an impact on the buttock. The tension of the Piriformis in these instances actually helps protect the area. 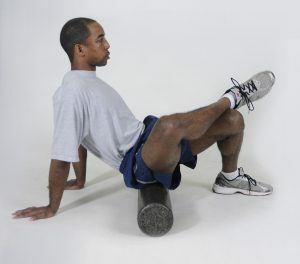 Unfortunately, it is not designed to do this and becomes tired quickly, resulting in the muscle knot and tension. Symptoms can be managed using hot or cold packs applied to the area, rolling the buttock on a foam roller or tennis ball and gentle stretches through the buttock. However, treatment of this condition should look to not only release the tension of the muscle but resolve the problem that is causing the muscle to be tight in the first place. Often patients report that they have been able to reduce symptoms using the methods above but symptoms return due to a lack of rehabilitation to correct the cause of the problem. This is why physiotherapy plays such a crucial part to resolving this problem.